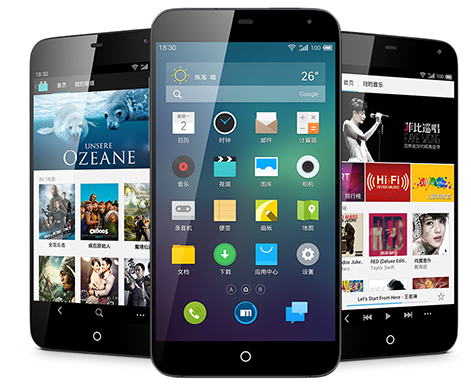 Meizu MX3 Android phone has been officially launched for International market. This phone was earlier launched for china and is the first phone which comes with massive 128 GB storage. Its predecessor Meizu Mx2 successfully captures global attention and now the new bigger and better MX3 will certainly ride waves. This phone comes with 5.1 Inch display with 1800 x1080 pixel resolution giving you a pixel density of 412 ppi. This is a fine clarity display and you won’t notice any resolved pixels. The body design and buid quality looks similar to Mx2. On the software front this phone comes with Android 4.2 Jelly bean with Flyme 3.0 UI on top. The primary camera is of 8 MP similar to Mx2. The camera lens is a wide aperture F/2.0 lens and comes with Fujitsu’s ISP to enable the capture speed up to 20fps. A front camera of 2 MP is also present in this phone. The battery capacity has been increased to 2400 mAh and Meizu claims this will give you 9 Hours of 3G Browsing and a full HD Video playback of 7 hrs. Other Connectivity features include NFC, Bluetooth 4.0, A-GPS support with GLONASS, and Wi-Fi. The international version of this device has been priced at $410 and will be soon available for purchase we will soon Update you with any availability information that we come across. The specifications of this phone look impressive and Since MX2 was amongst those rare devices from China like OPPO Find 5 which featured impressive built quality, we are excited about Meizu Mx3.